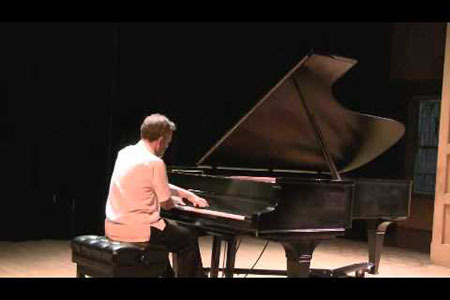 New Mexico-based pianist Fred Sturm has specialized in the music of Latin America for over twenty-five years, most recently focusing on the music of Mexican composers, and Federico Ibarra in particular, performing all of Ibarra’s works over a series of concerts devoted to music of Mexico and Spain. In addition to his new recording of music by Ibarra, Sturm has released five CDs to date, featuring music of the 20th century from Argentina, Brazil, Cuba, Mexico, and Spain by composers such as Ginastera, Villa-Lobos, Nazareth, Lecouna, Mompu, Granados, Turina, and Halffter. Sturm makes his home in Albuquerque, where he has made most of his living as a piano technician at the University of New Mexico for over 25 years. He regularly writes articles for the Piano Technicians Journal and teaches classes at national and regional conventions, including one entitled “From the Point of View of the Pianist,” where he tries to give his fellow piano technician a better understanding of the needs of the performing musician.